Isla Mujeres is a little slice of paradise. It's an island just off the coast of Cancún's chaos and a short ferry ride will get you there in about 20 minutes. I had heard rumours about this place, an island where people get around by foot, scooters and golf carts. My lovely partner Greer and I were heading to the Yucatan for a friend's wedding, so since we were already going to be close by, it made sense to check the island out before we headed home to Saskatoon. There's something very compelling about islands. They tend to go hand in hand with tales of adventure, often setting the stage to persuade a group of people to work together to survive, and hopefully thrive. An island's resources are typically limited, either in variety, amount, or both, and these limited resources guide and shape infrastructure choices, daily life and also local culture. At about 7 kilometres long and 650 meters wide, Isla Mujeres is small caribbean island, and one of it's scarcest resources is land. Land is a finite resource in general, and on this island land scarcity is amplified tenfold. 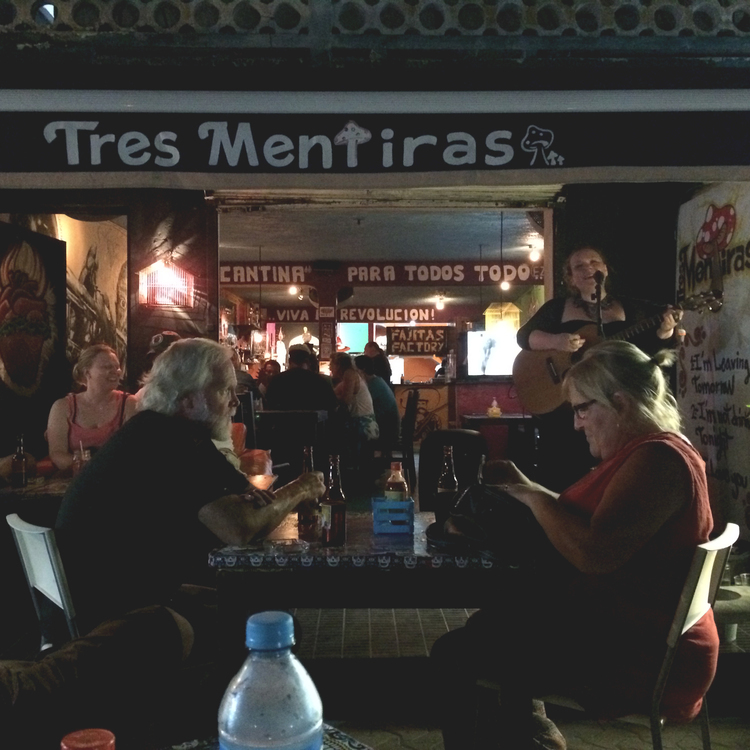 Not surprisingly, buildings, people and amenities are clustered together on Isla Mujeres. They have to be, because there really isn't any option to spread things out. This clustering creates a special kind of living urban environment, one full of density, diversity of buildings, and a mix of people across a wide age range. Its makeup reminded me of coral reef, full of colour, and full of life...and much like the ocean, there were hardly any cars around. Cars need land and they take up a lot of space. In Saskatoon, we dedicate a lot of land for automobiles with the intent of getting them from point A to point B as quickly as possible. There are good justifications for building these efficient pathways throughout any city, but this approach doesn't need to be the default design for every road. We don't need to gear every square inch of our urban and suburban landscapes for cars first and people second (or even dead last). 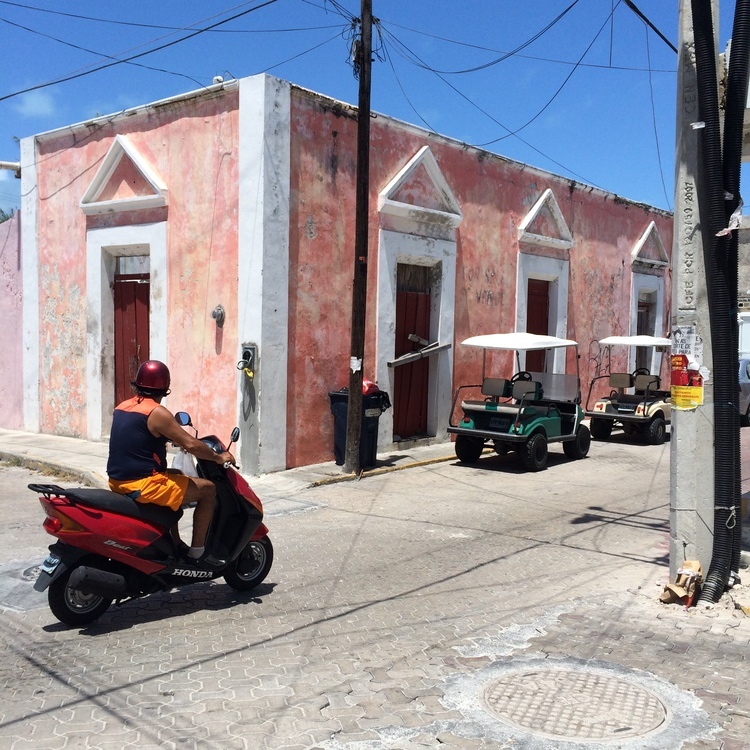 On Isla Mujeres, there are not any freeways cutting through the neighbourhood, no constant high speed traffic pacing by, and there is far less potential of collisions. There is also less smog. On Isla, the most effective, efficient and stress-free modes getting around are on foot or by bike or scooter. Not only are these activities good for human health, they are good for the community's social health as well because they connect all people to the urban environment and to each other in a very direct manner. In a single day, Greer and I had an incredible al fresco breakfast, hit the beach, visited local shops and merchants, explored the entire core commercial district, met some street performers, had a late night supper with a live performance, and made a connection with some fellow Canadians (they were the live music). It was a rich day, experienced entirely on foot. I didn't get in a car once, and not a single parking meter did I plug. With vehicles far in background of the experience, there was space and opportunities for so much more interaction (and 100% fewer parking tickets). I live and work in Riversdale, and I'm fortunate because this allows me to walk to The Two Twenty every day. The Two Twenty is the home of Shift Development and about 65 additional small businesses that form a beehive of entrepreneurs, startups, creatives, and social agencies. Greer and I still own and use a car, but now we only get behind the wheel once or twice a week to pick up groceries, go for a special trip across Saskatoon, or to skip town for the weekend. The positive environmental impact of using our car so infrequently is significant, but equally important is the improved quality of life we have experienced since moving here. Because we walk and cycle so often, we meet a lot of people in the process. We're on a first name basis with our neighbours and other residents of the community, and we've made friends with some of them, too. "Good morning" and "Hello!" are common expressions when meeting strangers, friends, and local business owners on the sidewalk (usually in front of Collective Coffee). We can quickly walk to The Farmer's Market for some grub, then take a few more steps and be on the riverbank ready to jump right in and cool off. In the evening we can walk down to Odd Couple, where the prospect of random encounters with friends - or even strangers - is high. Sounds a little like Isla Mujeres, doesn't it? As Greer and I walked through the narrow streets of the island, I sure thought so. There are definite similarities between the two places, but I think Riversdale (and all urban and suburban neighbourhoods) could borrow from Isla's playbook if we wish to improve the street-level experience. Riversdale has a lot going for it already, but the district has potential to be even more pedestrian-friendly than it already is. Lane reductions on 20th Street West are a perfect example of a change that would create a very positive impact for everyone. Lane reductions on 20th Street West would reduce traffic flow and calm traffic speeds, making more space for pedestrians and cyclists to circulate throughout the space. This structural change would contribute to an urban climate that people are naturally attracted to spend more time in any time of the year. If you disagree, I ask you to consider how many times you have found yourself wanting to go for a stroll along Idywyld Drive in Saskatoon. I'm willing to bet it doesn't really come up, probably because it's a very hostile space for people. This is because Idylwyld's design is intended to move high volumes of automobiles through it as fast as possible. Achieving that goal is perfectly OK and essential to urban planning, but it is important to realize that doing so comes with trade-offs towards other functions essential to urban life. 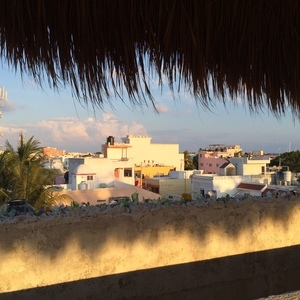 Visiting Isla Mujeres was exciting all around, but it was also a wake-up call. Wherever we live, our neighbourhoods grow and evolve based on the choices we make about what is important to us. We get to choose how we fashion our homes, neighborhoods and communities, and we don't have to choose to build neighbourhoods that are playgrounds for cars and hostile towards people. I suggest we shape Riversdale to emulate places such as Isla by not coughing up excessive space for automobiles. The trade-offs in culture and quality of experience are too drastic when we do. Lets reduce the number of lanes on 20th Street West from four to two and place a high priority on the pedestrian experience here. If we do this, we can create a fuller urban experience in Riversdale, something that is as compelling as any visit to a paradise like Isla Mujeres in Mexico.